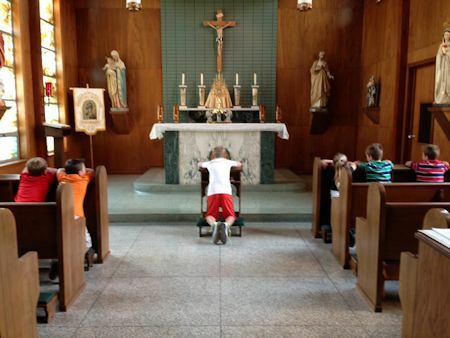 A CCD class visits the Adoration Chapel as part of their daily lesson. The Church of the Assumption's CCD -- Confraternity of Christian Doctrine -- is directed by Ricky Pellerin, Religion Coordinator. CCD classes provide religious instruction for those children in the parish who do not attend our Catholic Schools. Classes are held in the mornings of two consecutive weeks of June. The CCD office is located in the upstairs section of the Parish Center. The phone number is 337-828-9499. Our parish CCD motto: To know Him is to love Him!